It’s been a long time since we’ve girded our guts and forced down weird, hideous food and drink for your entertainment here at The A.V. Club, and for that, we apologize. It seemed like the well of misbegotten foodstuffs had dried up: Meat Water turned out to be a hoax, Sandwich In A Can never materialized beyond its promotional materials, and the vodka companies appeared to have run out of ill-advised flavor combinations. So we retreated, awaiting the next gastronomic challenger worthy of battling our impervious tongues and steel stomachs. The Hunger Breaks All Day Breakfast has been around for years across the pond, but has remained a curious culinary anomaly to us Yanks. The so-called “breakfast in a can”—a traditional English mélange of baked beans, sausages, mushrooms, chopped pork, bacon, and those dreaded egg nuggets, combined with something generically dubbed “cereal”—is a hearty, convenient kick-off to a day of indigestion and remorse. It isn’t available here in the U.S., but faithful, sadistic reader Oisín O’Connell (who pointed out that he’s “from Ireland—but we don't make or eat this stuff, so please don't blame us”) sent us a can. 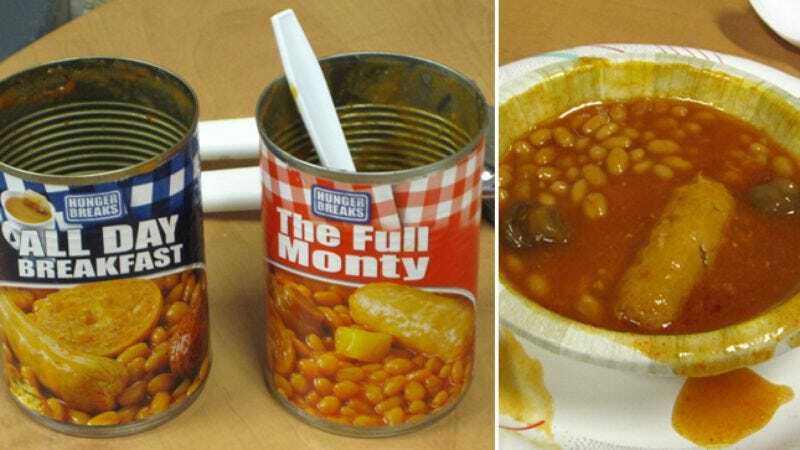 He also got us a sample of Hunger Breaks’ other canned-meal option, The Full Monty, which swaps out egg nuggets (that never stops being gross/fun to say!) for potato chunks and “a mini chopped & shaped beef & cereal cutlet.” Individually, none of the components are that offensive—egg nuggets aside—but when combined and shoved into a can that bears a label portraying the shiniest, most glistening beans and meat you ever did see, it becomes increasingly harder to theoretically stomach. There was only one person who could lead us in this charge into the bowels of English cuisine. And so we lit the Taste Test beacons high atop Mt. Onion and sounded the belching horns of gastrointestinal distress to summon the one and only Dave Chang from the cave into which he long ago retreated to contemplate in solitude the limitations of the human stomach. (It’s in Wisconsin, in case you’re wondering.) Under his leadership, we forged ahead into the eggy, nuggety depths of the All Day Breakfast. The taste: Truth is, as nice as it was to see Chang, we probably could have handled this one without his prodigious skills. The All Day Breakfast and The Full Monty aren’t nearly as gag-inducing as their descriptions imply; mostly they’re just bland, bland, bland. Everything tastes like beans—the sausages, the mushrooms, and, perhaps least surprisingly, the beans. There’s a vague hint of flavor from the “tomato sauce,” somewhat akin to watered-down Spaghetti-Os, but it really just tastes like the vague notion of nourishment being jammed down your throat in chunks of protein, fiber, and carbs. It’s nearly impossible to discern what’s what: There’s a tube-y, sausage-y-looking thing; a flat sausage-y looking thing; and a meatball-like clump of what might be sausage. The dreaded egg nuggets were tough to identify by sight—one sauce-covered lump starts to look like another pretty quickly—and completely anonymous in terms of taste. Where to get it: England. They can keep it.